Montessorians have been long-time believers that “…man’s mind [is] mathematical by nature” (Montessori, The Absorbent Mind) in as much that all human babies come into this world naturally hardwired to learn mathematics. Why then, people ask, are so many of today’s children growing up to be ‘mathematically illiterate’ adults? Because – as great thinkers such as French mathematician Blaise Pascal and Dr. Maria Montessori knew a century (or more) ago – if mathematical learning is not part of the child’s early experience, the numerical part of the mind goes undeveloped and learning math becomes much more difficult. We must therefore nurture the mathematical mind and stimulate its development by encouraging children to observe and interact-with the environment. 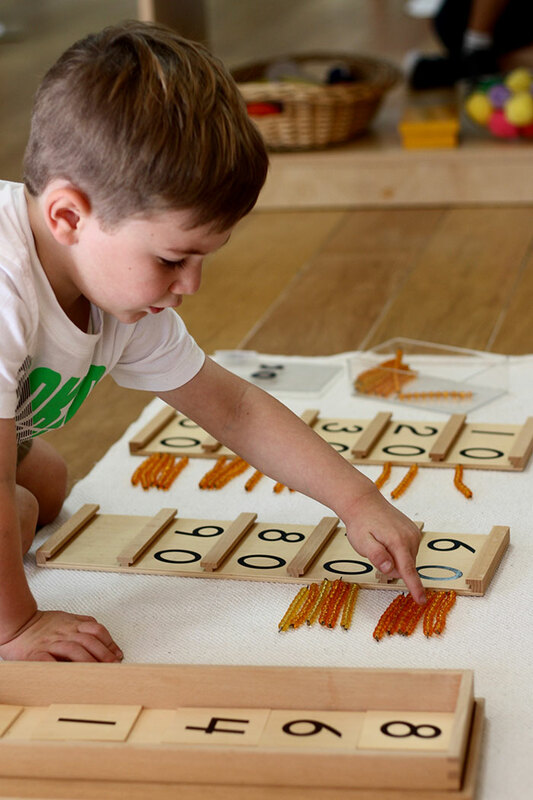 Dr. Montessori observed that young children learn early mathematical concepts through touching, stacking, sorting, and handling objects even before they learn to count them. It is through this active manipulation of various materials that children learn to recognize quantities, sequence, and patterns. This is the groundwork for basic mathematical principles and intrinsic to Montessori classrooms. To best understand Montessori’s Mathematics activities, it is best to understand the difference between mathematics and arithmetic. Mathematics is the science of dealing with quantity (numbers), magnitude, the relationships between figures and forms, and the relations between quantities expressed symbolically. Mathematics focuses on the logic of relationships and happens to encompass arithmetic, which is concerned with the process of computation. 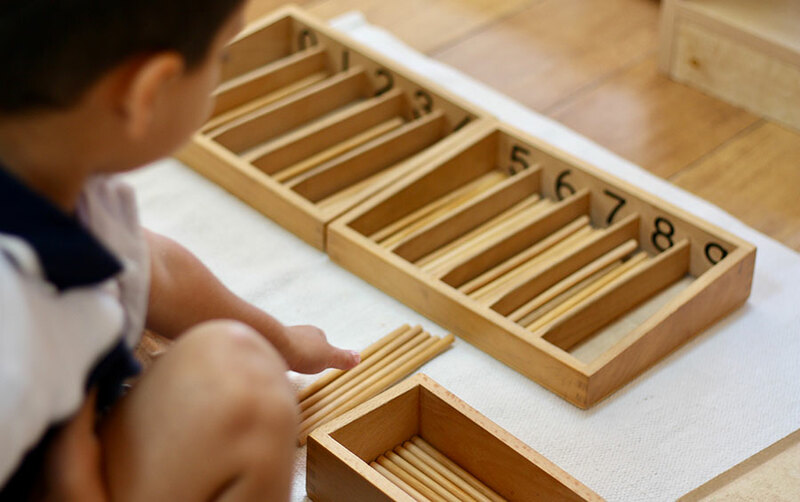 While Dr. Montessori appreciated the importance of children learning to recognize number symbols and do arithmetic calculations, she believed that this – alone – is not enough. Instead, she sought a return to ‘Mathematics’ and designed activities that would support a child’s deeper understanding of the logic behind those arithmetic operations. Not surprisingly, the activities in the Mathematics area are supported by an array of manipulative math materials that give the child the opportunity to explore number quantities and mathematical concepts in a real, hands-on way. Each new math concept is isolated and presented in a manner that gradually moves the child from concrete to abstract one step at a time. Teachers guide each individual child through the logical progression of the mathematics sequence; encourage repetition; introduce variations and extensions; and challenge the child with the next lesson when readiness is shown for a new or more abstract concept. Numeration – These activities include the concrete materials for introducing the symbols and quantities associated with numbers 1-10. Numeration begins with early counting and recognition activities (sandpaper numbers, number rods and number cards) and, when the child is ready, moves to introduce one-to-one correspondence, the appreciation of quantity, and the concept of zero (cards and counters, spindle boxes). Typical lessons in this group involve the sandpaper numbers, number rods and cards, number cards and counters, the short bead stair, the spindle boxes, and all reinforce the numerical concepts of 1-10. Linear / Skip Counting – These activities focus on linear counting and reinforce the concept of 11-19 (teen board), 10-90 (ten board), and 1-100 (hundred board). The child will learn to identify the symbols for numbers 11-100 and to build their corresponding values with the golden beads. All the while, the bead chains introduce the child to skip counting with numbers 1-10. Typical lessons in this group involve the teen board, the ten board, the hundred board, the golden bead materials, and the colored bead chains. The Decimal System – These activities introduce the concept of place value through the golden bead material. The child first becomes familiar with the names of the decimal categories (units, tens, hundreds, and thousands); then experiences each category concretely through the golden beads; and finally moves to associate quantity with symbol. Teachers and children work patiently with the golden beads to recognize, read, build, and operate with larger numbers and quantities (ex. 9,876). Typical lessons in this group involve the golden bead materials and the large number cards. Arithmetic / Operations – These activities build on a child’s understanding of the decimal system and introduce the concept and process of single-digit addition, subtraction, multiplication, and division. Over time, the child gradually progresses to the memorization of addition, subtraction, multiplication, and division facts; operations with larger numbers; and static and dynamic operations. Typical lessons in this group involve the addition/subtraction strip boards, the addition/subtraction snake games, the multiplication board, the unit division board, the arithmetic charts and tables, the bank game, and the stamp game. Measurement / Data – These activities help to give mathematics a more practical side and relate mathematics to other areas of the classroom (and life). Teachers introduce the child to the concept of measurement; encourage the measurement and comparison of quantity, length, weight, time, etc. ; and help the child learn how to represent that measurement or comparison. Typical lessons in this group involve fractions, rulers, scales, clocks, calendars, tables, and graphs. 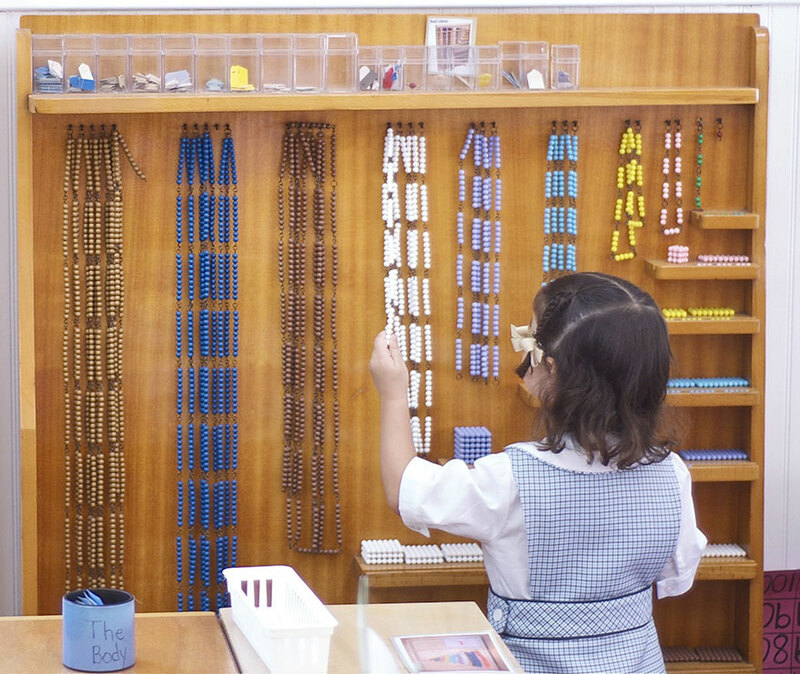 The Mathematics area is one of the easiest to find in a Montessori classroom and is usually anchored by the beauty and majesty of the bead cabinet and the golden bead materials. The materials have been carefully designed to be both appropriate and inviting to a child who is experiencing the sensitive period for learning mathematics.